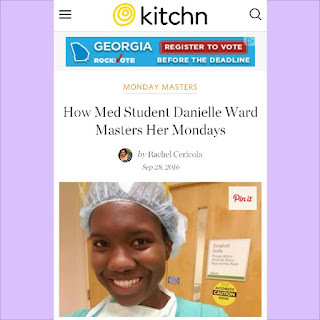 Aspiring Minority Doctor: Featured on The Kitchn!!!! Honored to be featured on The Kitchn! Happy Wednesday!!!! Today I was beyond honored and excited to find out that I have been featured on The Kitchn!!!! The article is part of a series detailing how five successful women handle Mondays, and I am absolutely amazed that they reached out to me to be a part of it. So far they have featured the New York Times bestselling author Jill Stokler, and actress Sarah Michelle Gellar. I am nowhere near the level of success of these women, so I am extremely humbled and appreciative of the fact that I am included in a series with them. The feature can be found HERE so feel free to check it out or click on the above picture to read in full! Great article, it is good that you are able to remain so positive even with such a demanding schedule. Keep up the great work! !